Today’s experiment takes place on Day 9 of the Firepot Stock Project which began with Part 1, the making of the basic stock. Part 1 required two days to complete, and on Day 5, after resting the stock, I brought it to the boil to keep it fresh. I also replenished some of the water and simmered it with some added meat, bone and vegetable trimmings I had leftover from a couple of other recipes cooked in the meantime. As you can see, our stock, even before the next major evolution, is acquiring new depths and layers of flavor. 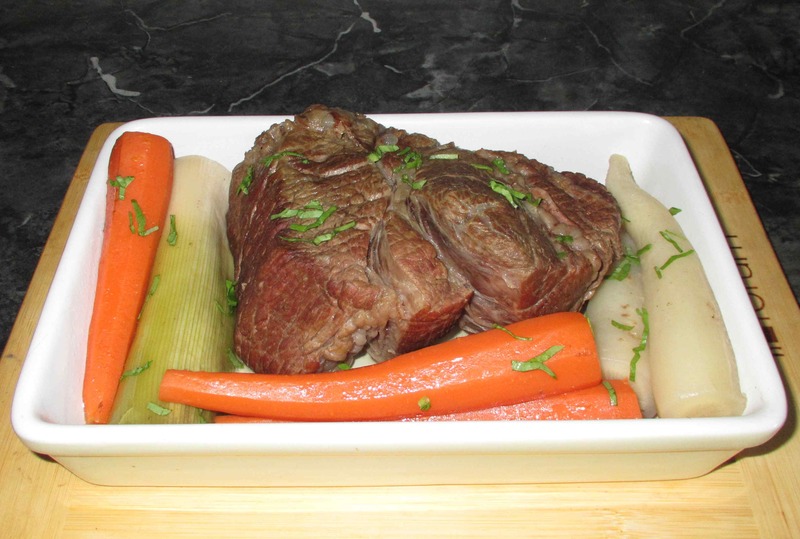 The beef I am using is a 1.3Kg cut labeled as ‘Pot Roast’, which essentially means it is a tougher cut more suited to moist methods of cooking rather than oven roasting. 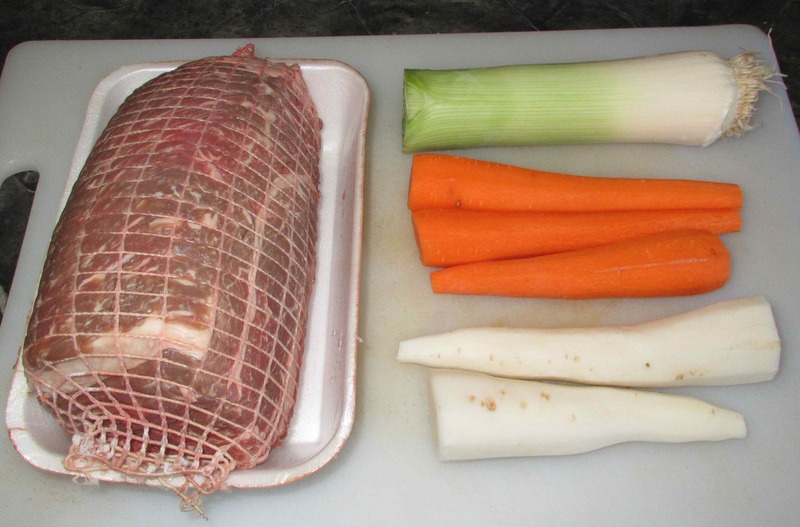 As for the vegetables, I am using leek (trimmed of most of the green), and some carrots. The other two items look rather like parsnip, but they are, in fact, very small daikon. I actually love parsnip but the taste can very strong and might lend too much of an aromatic punch to the stock. With just a couple, I might actually hazard that prospect if it was just myself, but my wife is not a huge fan anyway so I am going to use the much milder daikon instead. They take on a nice sweetness when stewed and I have used them in Chinese red-cooked dishes many times. The amount of vegetables may not seem like very much at all here but it will be only me and the wife sitting down to dinner and I will also be including some potatoes. It would be nice to cook the potatoes in the stock as well, but I am a little afraid of the starch making the liquid cloudy. I have read that even the peel can have this result so cooking the potatoes in their jackets may not prevent this. Possibly, this issue would make an interesting experimental project sometime but, for now, separate cooking is the order of the day. Here is the stock-pot just removed from the fridge. 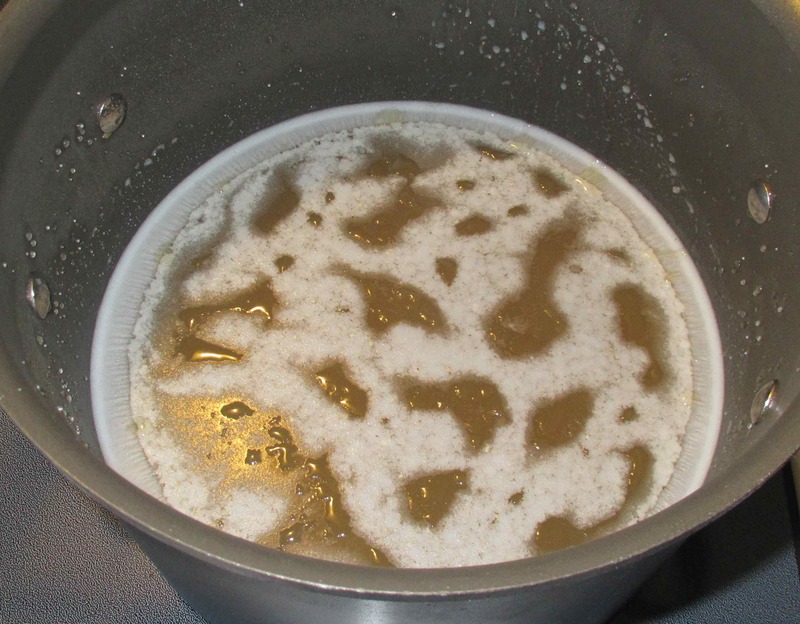 As you can see, the still jelled stock has a fair amount of fat congealed on the surface. If I were about to make soup from the stock it would be a simple matter to scoop it away but I don’t want to do that as yet. In the first place, a good layer of fat (thicker than this) can help keep the contents beneath fresh (think of ‘confit’) and there is still plenty of flavor potential in the fat. Accordingly, I am going to leave it where it is as I re-heat the pot for use. 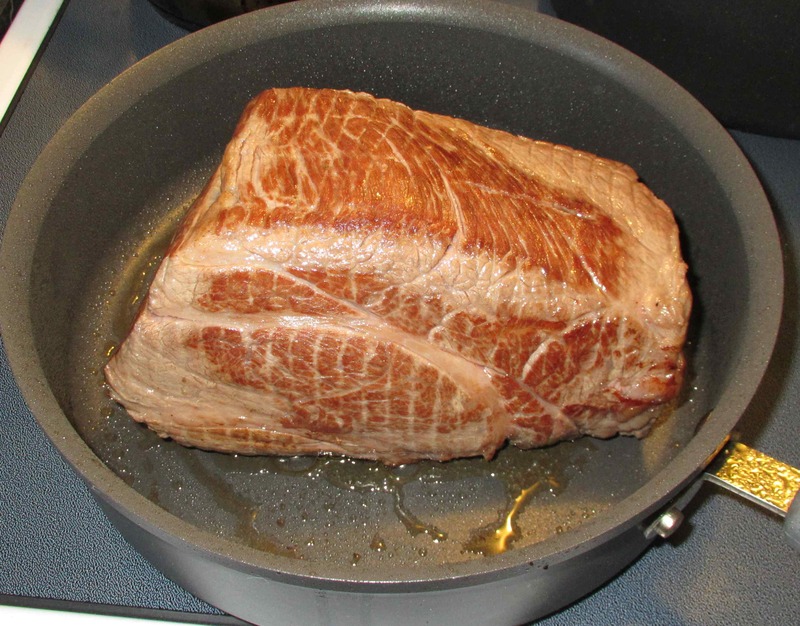 Instead of blanching the meat as I usually do for stocks, I am browning my ‘roast’ to get a bit of a Maillard Reaction going. This will not only help develop additional flavor, but will also give a slightly more attractive appearance to the finished cut that just plain stewing would do. 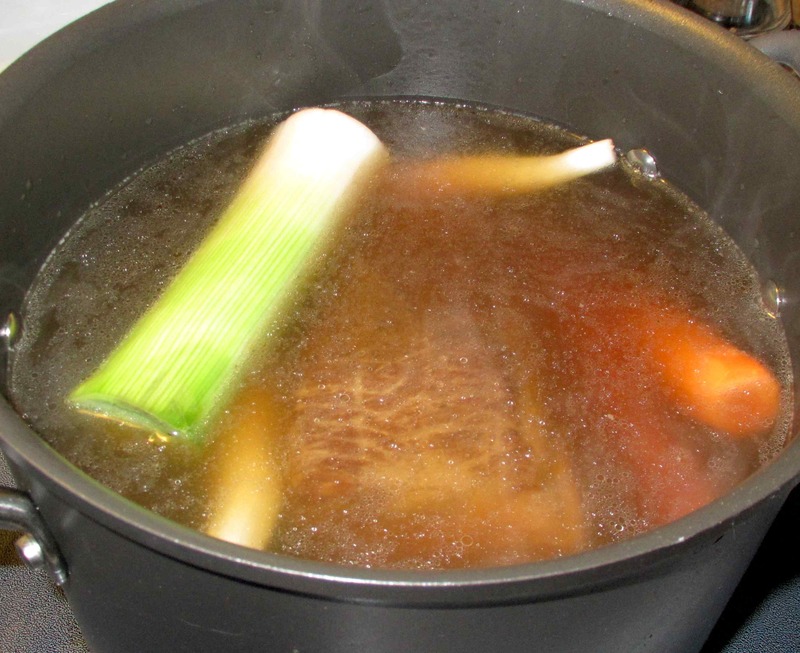 After bringing the stock to a vigorous boil, and skimming away a few blooms of scum, I added the meat and vegetables and immediately turned the heat down to low. The idea is to keep the pot going at no more than a moderate simmer for the remainder of the cooking time. It may sound counter-intuitive, but as fellow blogger Stefan has observed, cooking meat at too high a temperature, even in a fluid, will cause it take on a ‘dried-out’ texture. Naturally, we want ours to be as succulent and tender as possible. After 2 hours, the vegetables were just getting nicely tender and the meat registered a core temperature of about 162 degrees which should be at around a ‘medium’ level of ‘done-ness’. At this point, I turned off the heat and covered the pot for later. It will be interesting to see how letting the meat, and possibly the vegetables, would fare after an ongoing flavor exchange with the chilled and jelled stock for a day or so (and I plan to do this with the leftover meat), but I plan to have some of this for supper tonight and will thus re-heat it later. 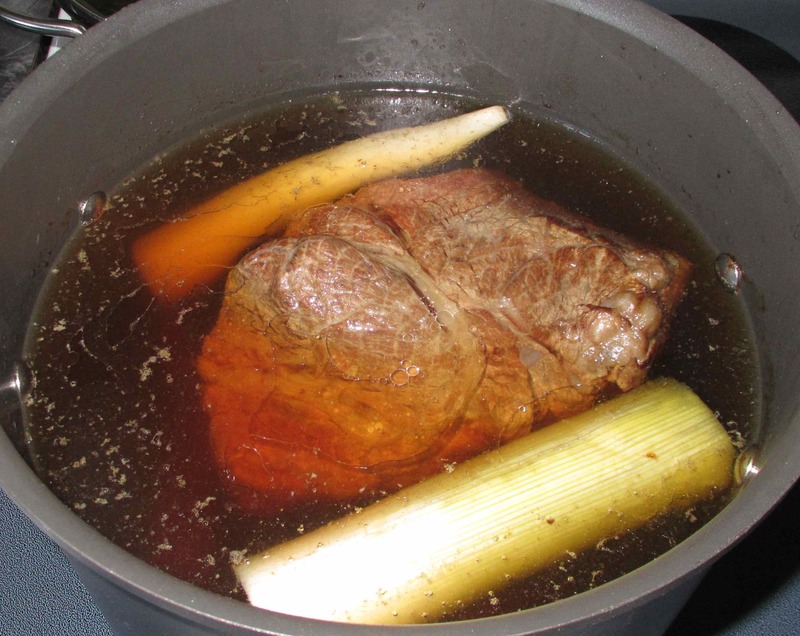 To avoid over-cooking the veggies, I will actually remove them from the stock while the meat warms up and then add them back for a few final minutes of cooking. This was definitely a nice ‘homey’ sort of meal. My wife was not especially impressed when I told her what I would be making and kept referring to it as ‘boiled beef’ with lots of eye-rolling and snide comments. As it was, though, she ended up enjoying a lot more than she thought she would. The daikon was a bit unfortunate, being a bit woody and bitter, but I can, thankfully, put that down to the quality of the produce rather than the cooking method. The rest of the vegetables were very nice and the beef was tender and had good flavor. 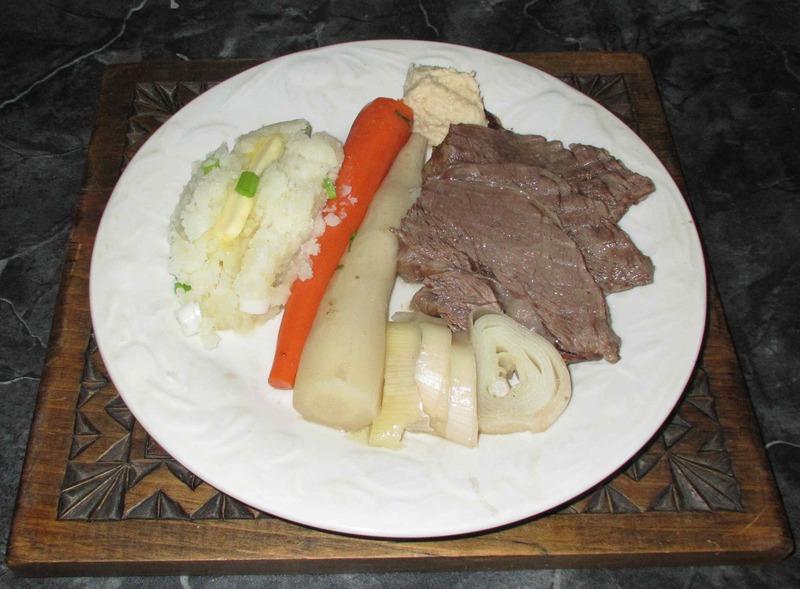 If I were to make this again, though, I would probably serve the dish immediately as soon as the veggies were tender so as to obtain maximum flavor from the beef. I think the slow cool-down and the subsequent re-warming took it a little past its peak in terms of taste. This looks like a hearty, comforting meal. Whenever I make dishes like this I make sure there is a piquant sauce to give it some interest. A sharp mustard sauce or even mint sauce would work for this. I had to laugh, the very first photo I thought it was a serving plate and the square plate looks just like the plate airplane meals come in. Only giant sized!